What is your opinion on this Winter Cover? Previous owner contacted me today with this cover. He said he was going to keep the cover for his new boat but doesn't fit. Now offering to me for $900. He says its custom for the boat but doesn't look like agreat fit to me. Never owned a cover so I'm not sure how great it is. Should have came with the freaking boat. I have the same boat and could not find a winter cover that was not custom made for that boat. I priced out a custom Fisher Canvass cover but at $1700 I passed. So I removed my Bimini tops, built a wooden frame and tarped in the cockpit area. I used a heavy duty 20'x20' tarp. It looks good, will support a heavy snow fall and protect the boat. Cost about $100 bucks, time about 2 hours. Next year I plan on doing a similar cover but will customize the tarp and framing for a better, faster fit and install. I would make the guy an offer on the cover it looks good and with a little adjustments it can be tightened up. You will not find one cheaper unless you do it yourself. I would be interested for $400 bucks. Yeah, I agree that half the price and it'd be worth it, cause it is not custom. I am one that has always had a custom cover and will say there are many benefits. It looks to me that he doesn't have it tied to tight. I wouldn't mind having a cover like that and I agree that it should have come with the boat. I would offer them $600 for it and see if he bites. Having a cover saves you a ton of time at the end of the season. Where I am at, shrink wrap is about $350 for the same size boat that you have. After 3 seasons of shrink wrap, it pays for itself. I am not a fan of tarping a boat. If it is windy where you are storing the boat, it has to be checked every few weeks to make sure it didn't tear after a wind storm. If it does, then you have to start over... Right now, I store my boat inside. Unfortunately the place where I store it is up for sale and I probably won't be back there next winter. At that point I will weigh the pros and cons on a custom cover or shrink. Looks like a nice cover, for the right price are those white tabs loops? looks like it isn't tied town. Do you all agree it's not custom? He is telling me that it is custom and someone came out to measure it. Does not look very form fitting but you can see that it's not completely tied down. Also I do not like that the blue hull is not completely covered. It looks custom to me from the picture. It isn't a Fisher cover, but it looks nice. If you wanted it to cover the rest of the blue, you could have a canvas shop add some pieces to the bottom of it. It most likely is custom. I can not find any "off the shelf" covers for the 270. Especially if you have an arch. So far my tarp is holding up fine it actually wraps completely around and under the hull. Plus the top of the cockpit is plywood so I get no sags. I would love to order a Fisher Canvass cover maybe next winter. I offered $400 and he said bottom dollar is $700. Still negotiating, let you know what I get it for. Appreciate the help everyone. Considering what we pay for shrink wrapping that sounds like a good deal, I just paid $450 to shrink wrap. I'm sure it'd be nice to have it on right now with the little bit of snow (although you may not be getting it down there). From the pics, it looks like you got it at my current marina (South River). Good luck with the purchase, and yes, it should've just came with the boat. Plus, the shipping cover that Rinker uses (which I will get to keep when it's shipped back) is 100% custom fit, has the under tie loops, and is at least twice as thick as any tarp I have seen. I'm going to use that (marina I'm at is going to let me keep it). I don't know why more marina's don't just remove those shipping covers and keep them for the customer instead of cutting them up (it's heavy duty plastic, non-shrink material). ??? -=Mike G.
Mine is a 28ft 8'6" beam, with 2 supports and 4 vents plus the door, $450, but they came to my home where i winter the boat. 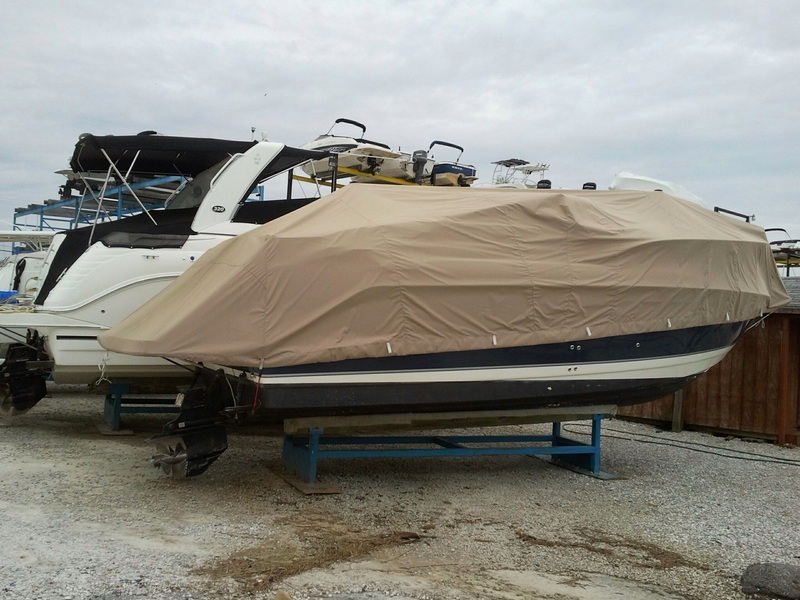 Mike_G, I know someone at my marina that had that shipping cover from their new 2000 340 Rinker until last year. Used it thru many rough winters until it finally ripped. That's great. You will be happy to have it! You need to bring that boat to our 10th Annual Chesapeake Rendezvous this year! Thing that most people don't look at is the air circulation. Shrink wrap includes vents by which your boat breathes. If you wrap it up air tight expect to clean some mold on your boat in the spring unless you put air vents on it. 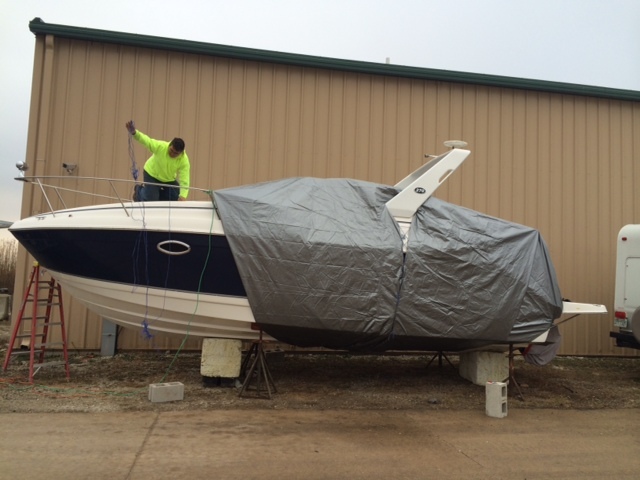 I get my boat shrink wrapped every year because once mold is in a boat it is almost impossible to remove. We pay > $6.40 / gal for fuel up here so I consider the cost of shrink wrap just another fill up. I've used custom covers for 10 winters now and never a problem with mildew. They always have vents installed and I make sure to check my damprid throughout the winter. I have heard about the mold issues with covers. Maybe I can have vents installed in the cover? Also possibility of leaving a window cracked for some air flow. Thoughts? I will check on boat regularly, remove cover for a few hours every so often. Handy is right. Just a bit south of Sassafras. You make it once and you will come back next year. The theme for this year is Christmas in July. Family oriented, but when it gets dark, all lets loose. I'll be posting the topic soon, but take a look at our last few years. Sounds like a blast. Do most boat in if able or drive? We boat in and raft together for the weekend. We did have one fly in last year with one of those hydroplanes. A winter is gone and summer is just starting so I think no need to cover up the boat. Well, I am a project manager by profession and I am working in Dubai at Alwasl Dhow. They give you a better dhow cruise Dubai services. They have a luxury cruises and amazing facilities.